This is the first in a series of posts on objects associated with lacemaking even though that association might not always be defensible. My purpose is three-fold. First and foremost to educate the collector about some lesser known objects that actually are lace-related. Second, I attempt to trace the origins of the “lacemaker” name association for items with obviously different original functions. It is pointless to try and convince collectors to abandon well-established names, so I take the more interesting track of trying to understand how the names evolved in the first place. Lastly I would like explore a related subject; how objects can span the range from original to reproduction to outright fake. These posts will be expanded as new objects come to light. And speaking of light, that is the subject of this first post. Brian Lemin’s excellent piece on lacemaker’s lamps at http://lace.lacefairy.com/Lace/Gallery/LaceLamps.html provides much valuable information on the subject (Note, the Lace Fairy site is no longer in operation, but I’m trying to work with Brian to recover some of the posts). In view of his work I will forego an introductory discussion of glass focusing lamps, and go directly to some specialized topics. Note also, I don’t go much into dating items. There are some claiming late 18th century origin, but this is difficult to prove. Most of these items were widely made in the 19th and early 20th century, and I will leave it to other researchers to delve into manufacturers and specific dates. One should also keep in mind that controversy over the ‘lacemaker’ label works both ways. One commentator on early lighting laments the fact that lacemakers always get the credit for focused lighting, even though it was used in many trades. Lacemakers themselves often faint in horror at the practice of early lighting collectors who label certain blown glass structures as “lacemaker’s lamps” when in fact they are wick-based oil lamps. 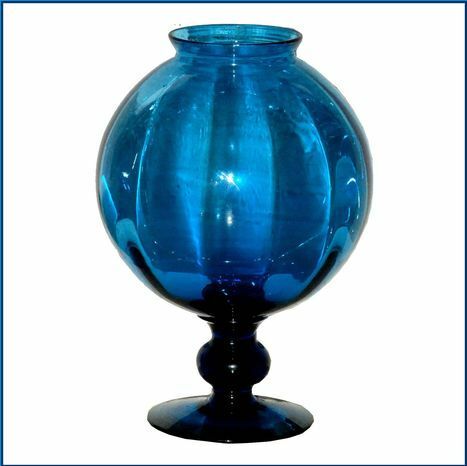 These blown glass lamps come in a large number of forms, but share common elements of a more or less round hollow reservoir with a normally rimless opening to admit a fluid (whale oil for lighting or perhaps water for focusing). Some of the most roundly abused types are shown in Figures 1a through 1c. The reservoir ranges from spherical to a flattened sphere to triangular, but is always supported on an attached base which often has a handle. Figure 1a shows examples which come closest to a useful focusing device, and if you read further on, you will find that people have recently tried to see just how workable they might be as light condensers. A ‘peg lamp’ adaptation is shown in Figure 1b. Figure 1c shows variations on this theme which move a little too far away from a possible focusing use, but still bear the “lacemaker’s lamp” name. Many other examples can be found at the auction archive web site http://tinyurl.com/3nvtdpq. Figure 1a. The examples are oil-based “lacemaker’s lamps” made all in one piece. The first is a 9″ tall English example that can often be found at auction. The globe is 3.4″ in diameter. Second is a similar French “loupe or lampe de dentelliére”, where the term “loupe” means “magnifier” – also showing that the lacemaker association is not confined to English speaking countries. 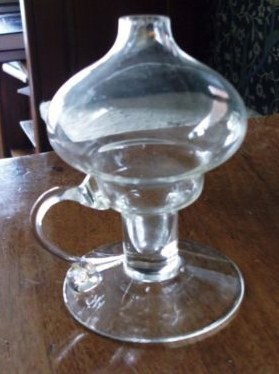 It has a decorative pressed glass base. Caution, such pieces are being reproduced today. Look for a well-defined pontil mark on the bottom of the base. Figure 1b. Examples such as this come up occasionally, and are often labeled ‘lacemaker’s lamps’. They are also known as a ‘peg’ lamps; a glass oil lamp with a ‘peg’ at the bottom that can be inserted into a standard candlestick. 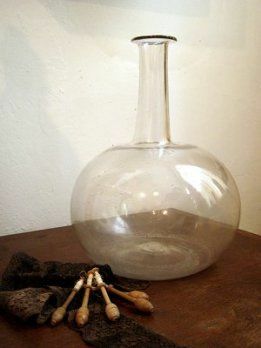 The adaptation allows a candlestick to do double duty as an oil lamp. (thanks to Brian Lemin for the peg lamp attribution). I’ve found indications that this example may be French. Figure 1c. “Lacemaker’s lamp” variations – it would be difficult to use these as focusing devices. Those with handles are sometimes known as ‘finger lamps’. 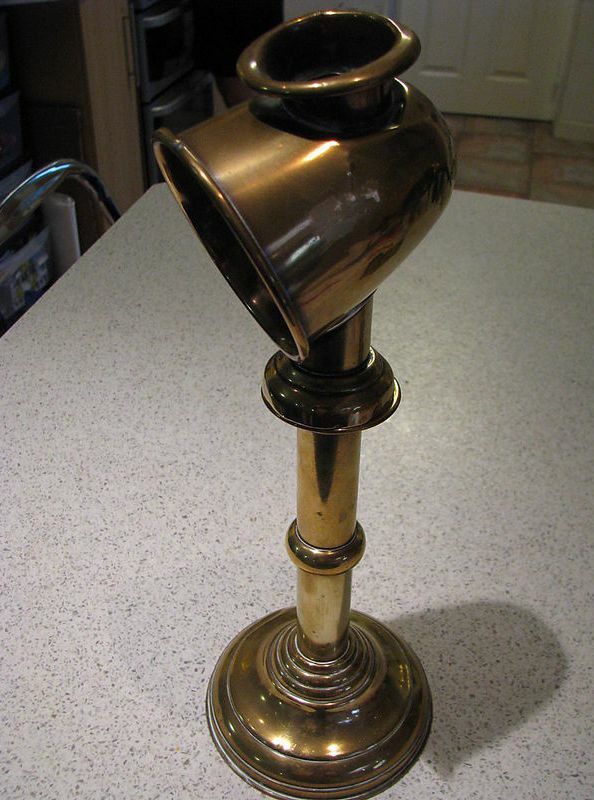 In trying to trace the association of the name with this type of lamp, see Figure 2. 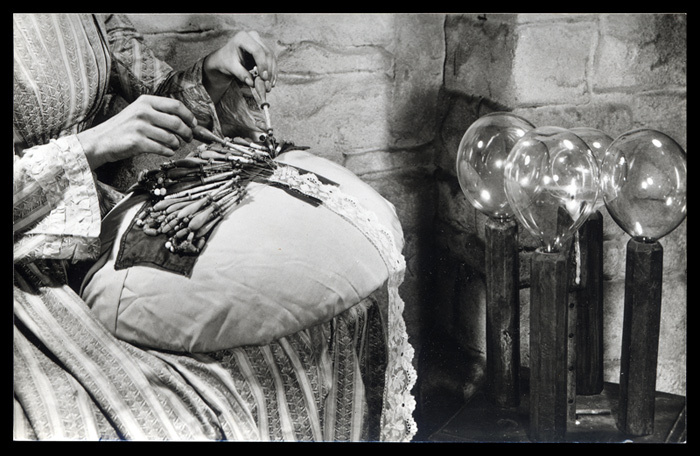 The photo is from collector T. L. Huetson’s “Lace and Bobbins”, first published in 1976, and the glass pieces are clearly labeled as lace-maker’s lamps. Gertrude Whiting in “Old-Time Tools & Toys of Needlework” (1928) does not mention this form in her discussion of magnified lighting. So perhaps these two works bound the period where the name was first attached. Figure 2. 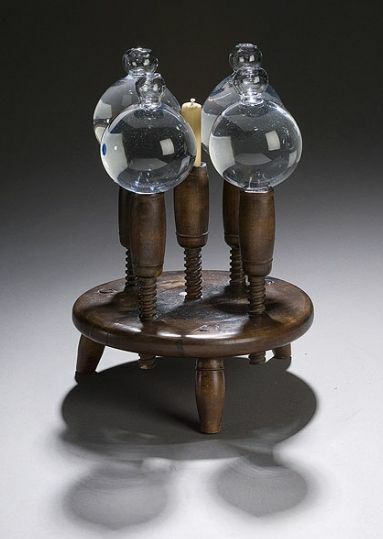 Two whale oil “lacemaker’s lamps”, one with a handle, shown with other lacemaking equipment by Heutson. As an antiques collector Heutson would have been familiar with this terminology. In December 2010 David Springett sold a lamp similar to the first example in Figure 1a on Ebay, accompanied by a lengthy description of how it could be used as a focusing device. He went so far as to measure the focal length with candle lighting.The possibility that such a lamp could have been used as a focusing device by an enterprising lacemaker, even with the small diameter globe, may not be so far a stretch as first imagined. Some day I’ll do a post on analyzing focal lengths through a glass shell filled with water. 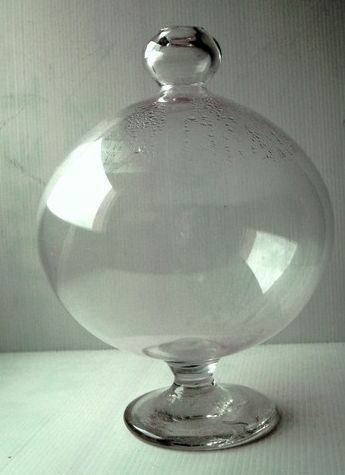 It’s not so simple because of the isotropic nature of the light source, the combined index of refraction of the glass filled with water, and the irregular surface of the blown glass sphere. But the thing to remember at this point is that the focal length scales with the radius of the sphere – the larger the sphere, the farther away you can be before you lose the light concentration. This is actually an incentive to elongate the glass bulb, which produces a larger radius in the vertical direction. 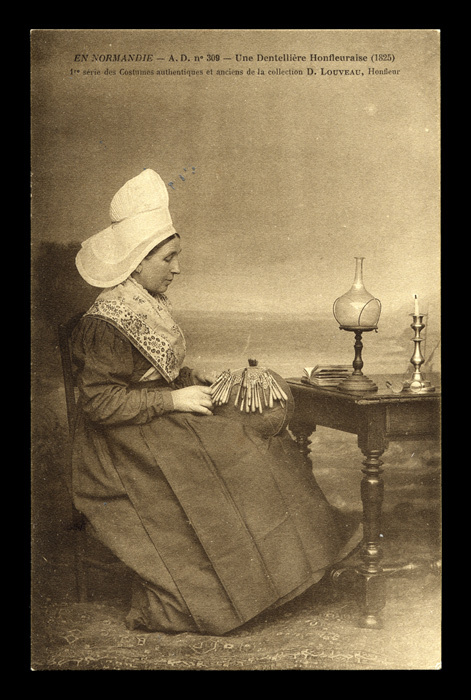 Figure 3 shows a rather staged demonstration of 19th century lacemaking (the bobbin threads are just pinned to a machine made piece of lace). 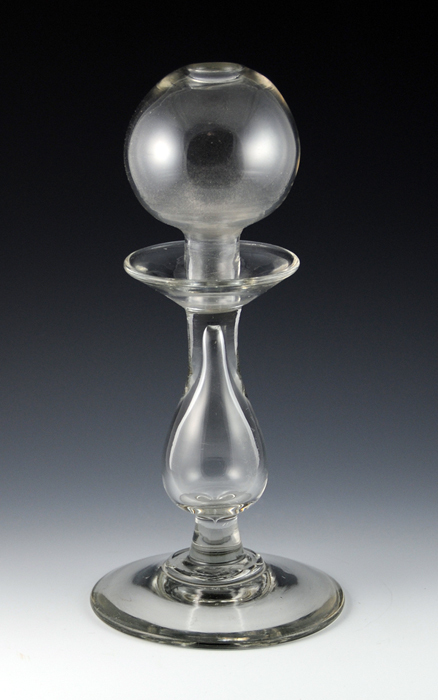 But the candlestand is quite nice, showing the more accepted English form of the lacemaker’s water focusing globe. English focusing lamps generally have a projection at the bottom so that the globe can fit into a hollow cylindrical support. This helps stabilize the bulb. Figure 3. Staged lacemaking demonstration with a magnifying candlestand. A similar example recently sold on Ebay. 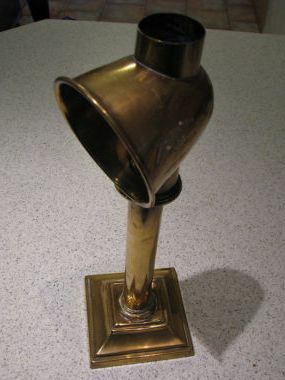 An English focusing lamp in this configuration is sometimes known as a “flash”. See LaceNews Ebay Alerts for Feburary 17, 2011. Figures 4 and 5 show English examples with their accompanying woven rush storage ‘hutches’. These hutches are often hung over a bulb support on the stand. The projection in both examples are the water filling tubes. 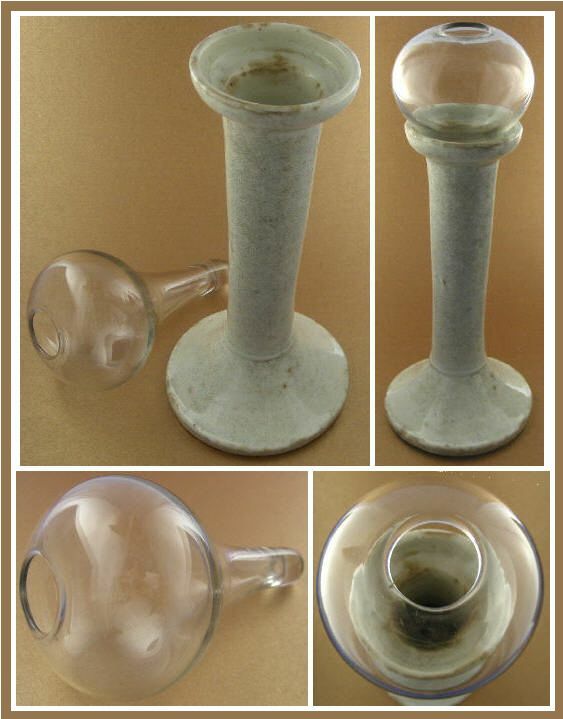 Both can be stopped by a cork, inverted, and placed into the cylindrical recepticle on the candlestand. The elongated form seen in Figure 5 helps increase the focal length. I assume the green tint to the glass helps with some glare problem. Much has been made of the quality of water that should fill such globes, ‘snow water’ is often sited as being of exceptional quality. I can’t vouch for the purity of snow water or its actual composition or even if it ever fell from the sky on a cold winter’s day. Aristotle mentions distilled water, and the manufacture was described in detail by Alexander of Aphrodisias in 200 AD. That makes it a viable alternative. But I do note that the example in Figure 4 survived the trip from England to New Mexico via DHL filled with some kind of old water. Yes, the water is very clear, although there are a few tiny black floaters and some cork fragments. 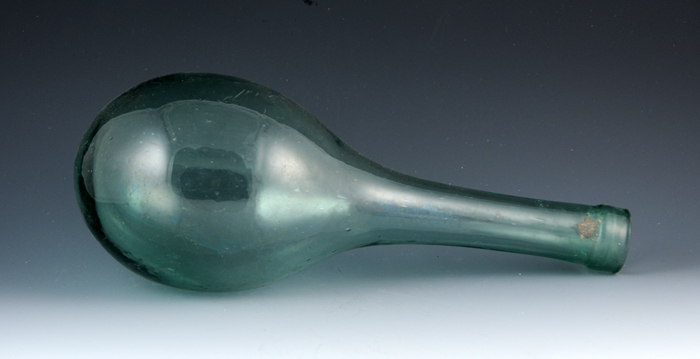 The filling tube is stopped with a cork, and this example has some cracks in the glass around that site. Water can be very nasty stuff. In the presence of ultravoilet light it can dissociate into highly corrosive hydrogen peroxide and other molecules. 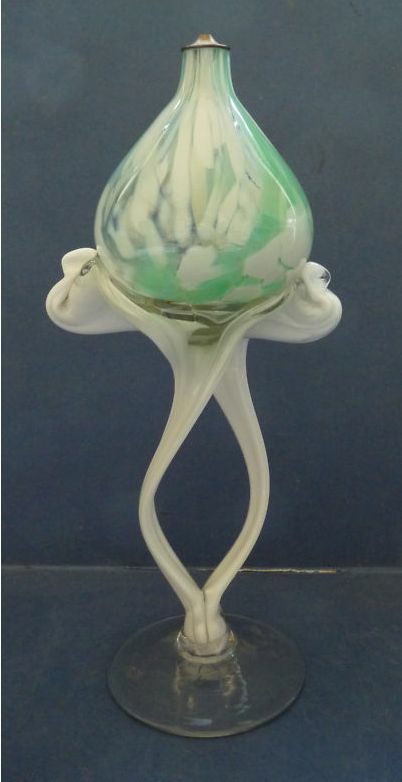 Such pieces are best kept out of intense sunlight – and filled/stoppered globes like this do come up for sale more often that one might expect. Figure 4. 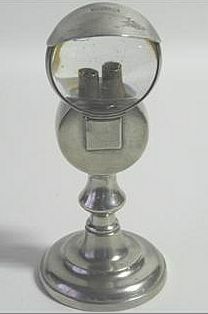 Spherical lacemaker’s focusing lamp shown upside down with original hutch, 4-3/4″ diameter bulb. Figure 5. Elongated, green tinted bulb with the original hutch, which is difficult to fake. The glass is 9″ long. 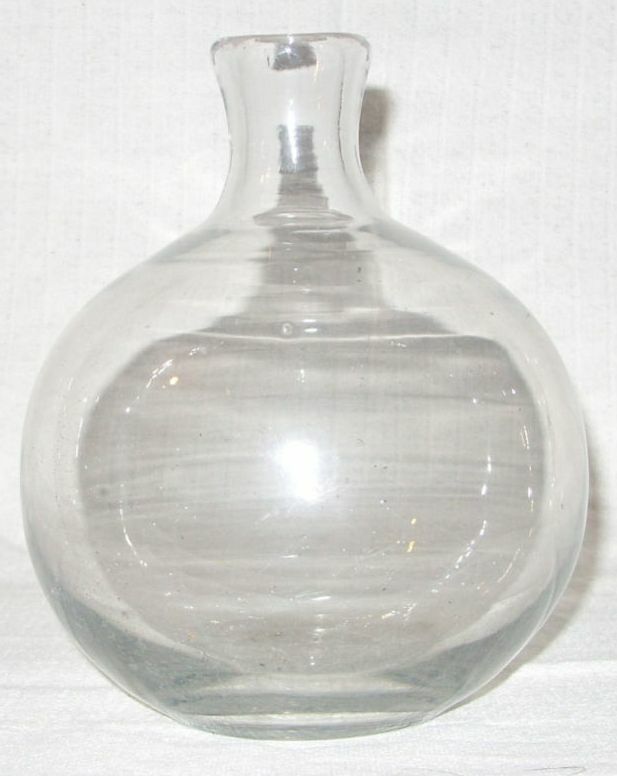 It is possible that this form started life as some kind of bottle. 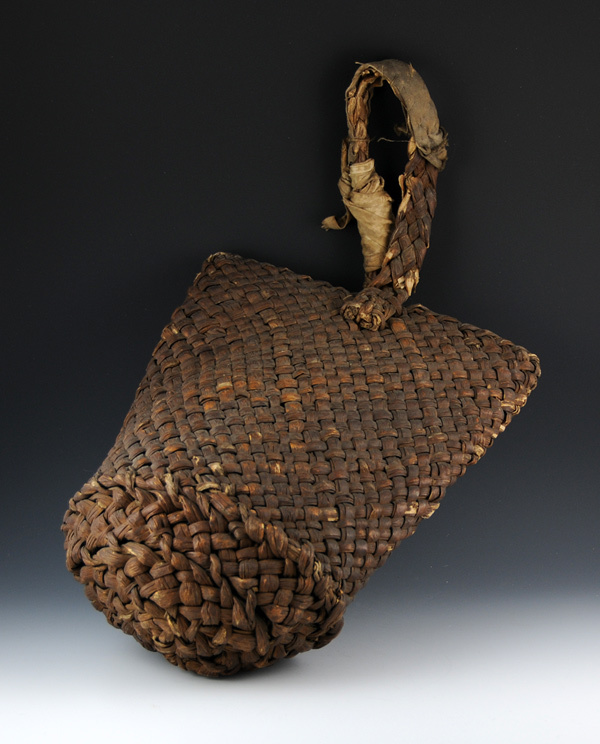 Note, in 2017 the hutch illustrated above was borrowed by an English rush basket weaver who did an exact copy of the piece. I’ll get that photographed and posted shortly. 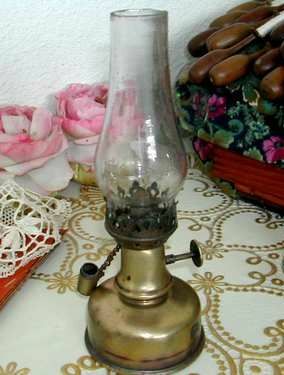 “Lace-maker’s lamp from the neighborhood of Valangin, Switzerland. The central globe holds a wick floating in oil”. Focusing lamps were not used only by lacemakers, but by others doing fine work including engravers, watchmakers and jewelers. A Swiss origin makes sense. Valangin is both a watchmaking center and is in the canton of Neuchâtel, the Swiss lacemaking center. Gertrude Whiting herself lived in New York, was an honorary fellow of the Metropolitan Museum of Art, a Fellow of the Institute Professional Neuchâtelois de Dentelles, and founder of the Needle and Bobbin Club. So one could assume the attribution of the piece is quite solid. I have never seen the term ‘waterlight’ used anywhere else. I’ll just assume the cataloger was not familiar with Whiting’s book. 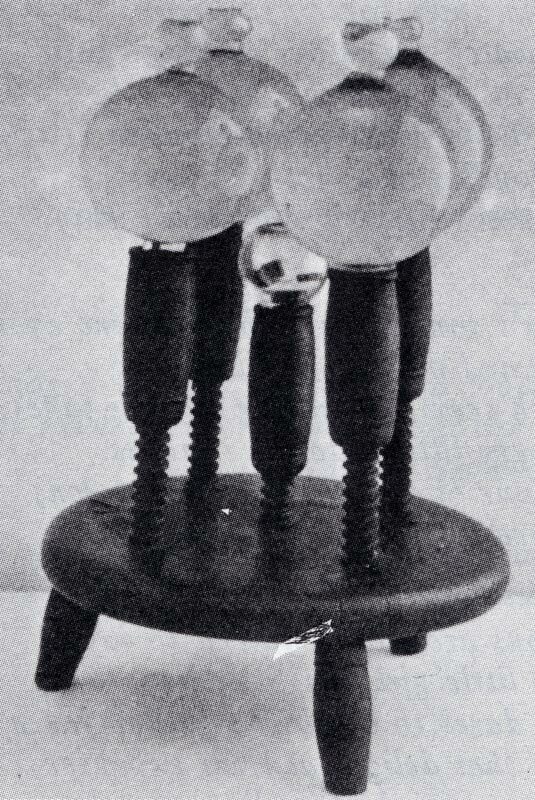 The third photo in Figure 6 is a very similar light arrangement, with 5 globes and a central lamp. 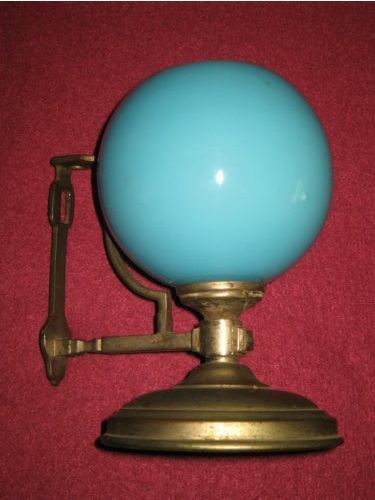 Figure 7 shows a closeup of the lamp and a globe. It was found in England, and appears to have been ‘married’ to a three-legged stand very much like that used in English horseshoe lace stands. The small shelf partway up is a definite later addition. The supports for the globes screw into the base, but the threads are quite worn and don’t work very well. I believe the Swiss attribution of the items in Figures 6 & 7 is undisputed. Particularly in view of the example dated 1830-1840 at the Musée d’histoire, La Chaux-de-Fonds in Neuchâtel. See it at http://www.imagesdupatrimoine.ch/notice/article/leclairage-des-dentellieres.html. From this example we learn that the Swiss term for the lamp is ‘globier’. And that the watchmaking industry largely replaced lacemaking in Neuchâtel, faced with increasing competition from machine lace by the mid 19th century. Marie-Louise Montadon has recently published two excellent books on Neuchâtel lace, La dentelle de Neuchâtel (1998) and Dentelles de Neuchâtel: de la production à l’exportation (2007). Figure 6. Left: Whiting example from Switzerland. Middle: Possibly the same piece sold at auction in 2007. Right: Similar piece married to what looks like an English lacemaker’s pillow stand. Figure 7. Left: Closeup of a globe and the central light from the third example shown in Figure 6. The bulb diameter is 4.5″. The globes all vary slightly in diameter. Right: A similar globe used with a freestanding base, 6.25″ in diameter – quite large. Turning now to French lacemaking lamps, several differences are immediately apparent. 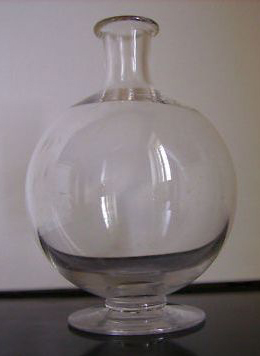 The radius of the glass bulb is approximately the same as in English spherical examples. But French glasses stand upright usually on a flattened base as seen in the examples shown in Figure 8, and often come with a homemade case constructed from a bobbinlace pricking. 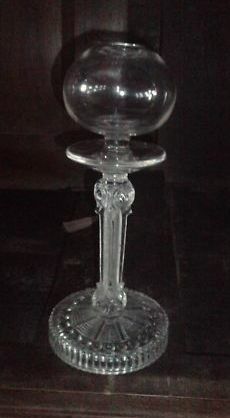 The height of the glass was often adjusted with a stand, such as that illustrated in Figure 9. 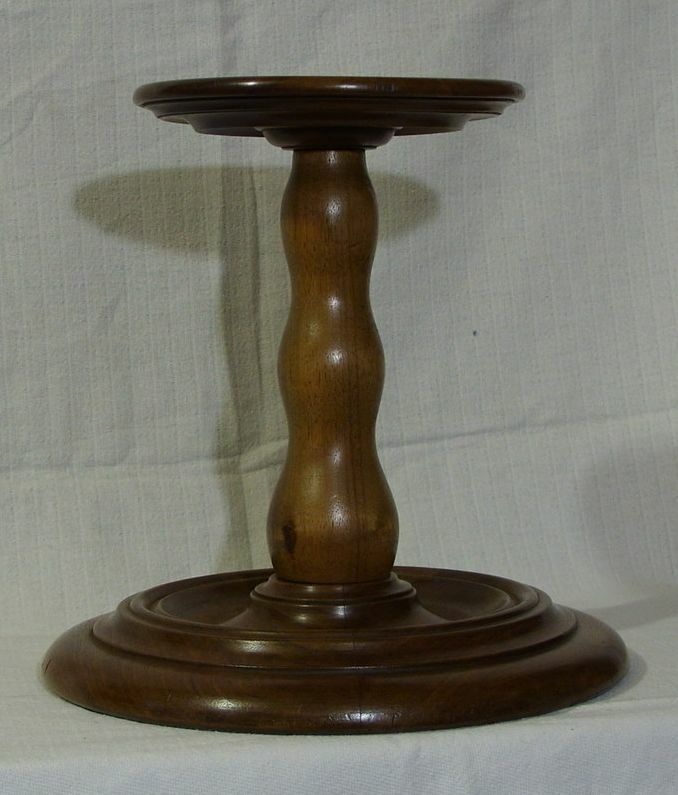 A turned wood stand 25.5 cm high recently sold on Ebay (see LaceNews Ebay Alerts for April 7, 2011). I have also seen very primitive stands just formed of a simple cone of metal, meant to secure the position of a globe without a flat base. I have also occasionally seen the word ‘doulhi’ associated with this kind of lamp, but am unsure of its origin. Figure 8. French focusing lamps. Right – 4.7″ in diameter. Note the cap on the spout. The spout itself is a little tilted, and the base isn’t quite centered. Someone has made a case for this lamp out of an old bobbinlace pattern. The whole set has so much character, whereas the first example is beautiful, but a little predictable. This bobbinlace pattern holder arrangement is not unknown, see http://tinyurl.com/3wakxyg. Also see Figure 15 for another example. Figure 9. This famous image has been extensively described by Claudette and Michel Bouvot in “Dentelles Normandes, Honfleur et Vire”. It is a recreation of a lacemaker working at her pillow from the Honfleur area around 1825. The costume is from the collection of the Louveau family, which can be seen today in the Eugéne-Boudin museum in Honfleur (named after the impressionist painter). This image is perhaps the only remaining representation of equipment from the old Honfleur lace industry. Note the unique tambour pillow held between the knees. The lamp and stand are presumed original to the area. The stand at the right is from a recent Ebay sale and strongly resembles that in the Honfleur photo, but with a larger diameter base. The lacemaker’s lamp and stand are still objects of innovation, as shown in the Canadian example in Figure 10. This design is by Eugene Schlaak, Niagra Falls, Ontario, http://tinyurl.com/3dn53el. Figure 10. Modern integrated design from Canada. Some variations on what are probably pieces meant to be used by lacemakers are shown in Figures 11 and 12. These examples have an attached pedestal, and can be of varying height, primarily due to the different neck lengths. Figure 11. French footed Lacemaker’s lamp variation. The top three have an open cone-shaped foot, with necks of varying height. Sometimes such glasses are labeled as coming from Normandy, although they can also be found in English lace literature. The third photo is of a recently sold Ebay ‘Loupe de Dentelliére’, see http://tinyurl.com/86suhrq. It has a similar bases, but quite an elegant elongation of the neck. 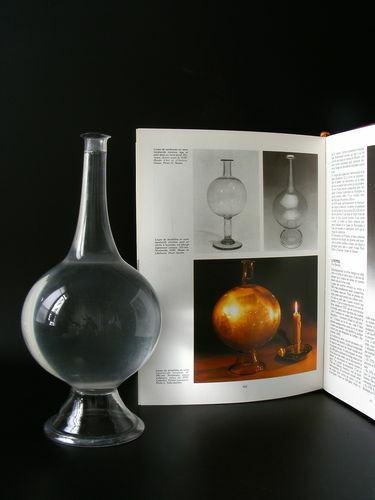 A similar object is contained in the accompanying work, “Verre d’usage et de prestige – 1500-1800″, by Jacqueline Bellanger, published in 1988. I have not read this work, so am unsure if there is a more detailed attribution. (thanks to the seller of this beautiful lamp for permission to show the photo). 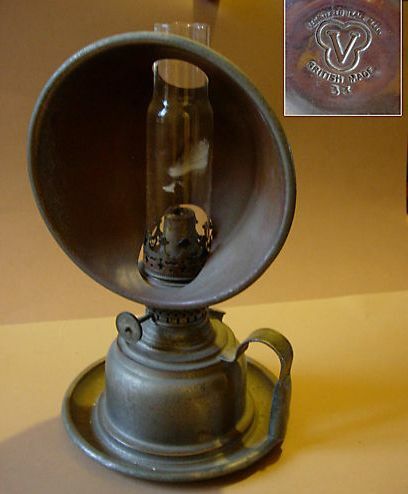 Note, reproductions of such lamps are around, see http://tinyurl.com/3dzr7d and http://tinyurl.com/43z2bvl. Modern reproductions tend to have thinner glass, but still, buyer beware. Figure 12. These three examples have pedestal feet, but still retain the bulb and top opening typical of the examples in Figure 12. Such variations may have been used to focus light, and it is difficult to guess at an alternative use. The type shown in the second example comes up surprisingly often in auctions. The elaborate example in the last photo was purchased from a French dealer. The diameter of the sphere is 5-1/8″, which would give a longer focal length. It is quite heavy – unfortunately it arrived in the mail broken into several large pieces and several hundred smaller ones. Focusing lamps can have a varied original intent, but if it works, who are we to object? 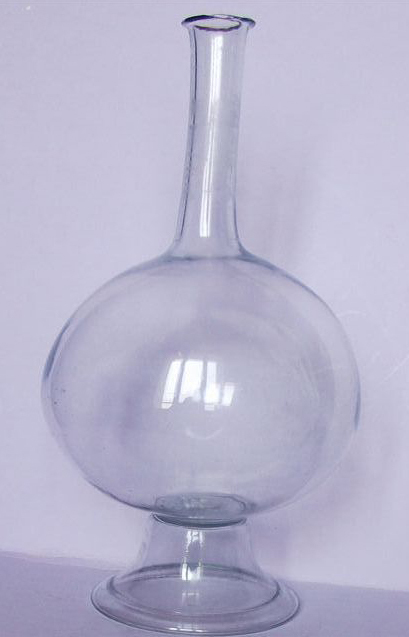 The two examples shown in Figure 13 I believe are adapted from chemical laboratory glassware. 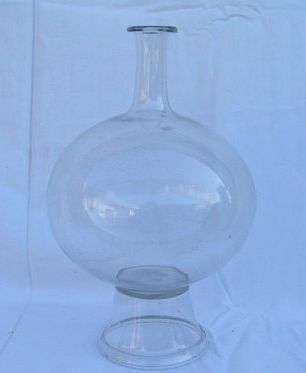 The Florence flask comes in many sizes and is used to boil liquids. It is a spherical globe with a neck that varies greatly in length, and may or may not have a flattened base. These flasks are suspended by a clamp on the neck so they can be heated from below. A small lip is present at the top to stop the piece from slipping off the clamp. 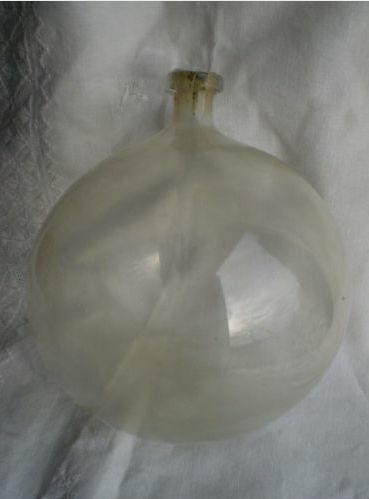 Florence flasks are an interesting widely available item with which a modern lacemaker could experiment. The third image was contributed by LaceNews reader Liz Burden, and frankly I’m not sure what it was originally for. But does magnify, as Liz nicely demonstrates. Figure 13. 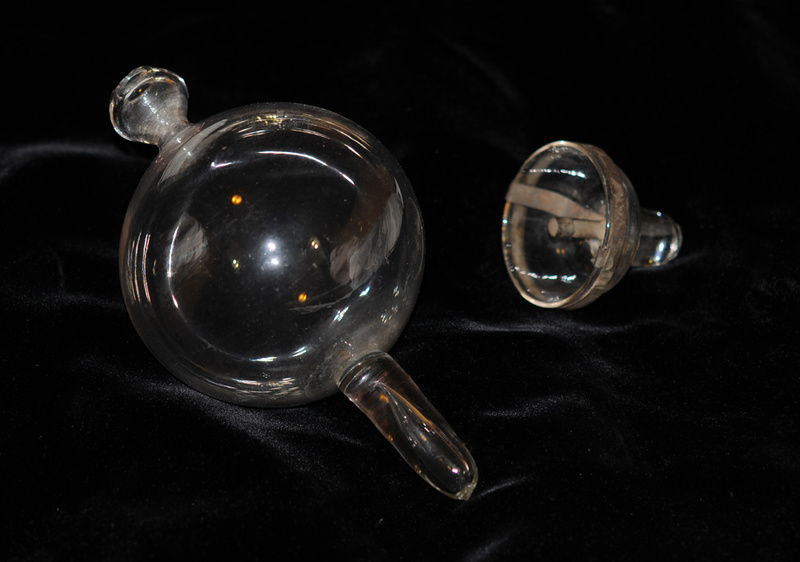 At the top are two examples of Florence flasks used as lacemaker’s focusing lamps. The long neck helps the user swirl around a hot liquid. They can have flat or spherical bottoms, and come in many sizes. The bottom image was contributed by Liz Burden and is the example she describes in the comment below. This is a self-sealed object, and one can only speculate on its original purpose. But it looks like it would make a good magnifier. Figure 14 shows something you definitely don’t want to mistake for a lacemaker’s lamp, although they are often labeled as such. 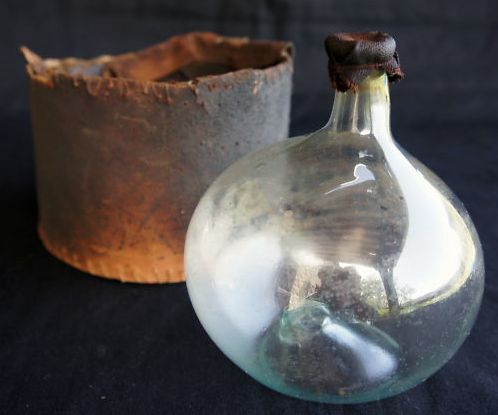 They are glass leech jars, used for keeping medicinal leeches. One would cover the bowl with a muslin cloth and tie it tight just under the lip so the leech can’t climb out (having grown up around the lakes of Northern Minnesota, believe me, they will). Occasionally the lip is not present. Figure 14. Glass leech jars. 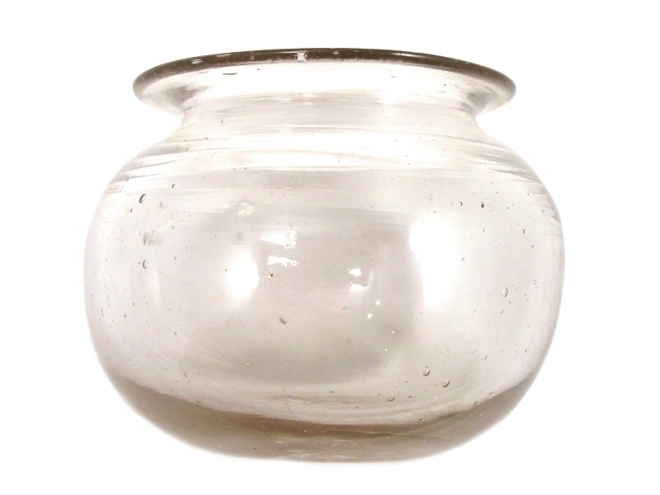 Usually leach jar bowls are larger than the ~5″ diameter lacemaker’s focusing lamp, but they can be found in smaller sizes without the foot (see photo at http://tinyurl.com/3nergtz). All variations are often labeled as lacemaker’s lamps. Turning now to the light itself, figure 15 shows two examples of ‘lacemakers lamps’ from France which do seem to be specifically designed for a lamp/globe/case set. The lamps are quite simple and unscrew at the top for filling. The wick height can be controlled by turning the nob at the side. 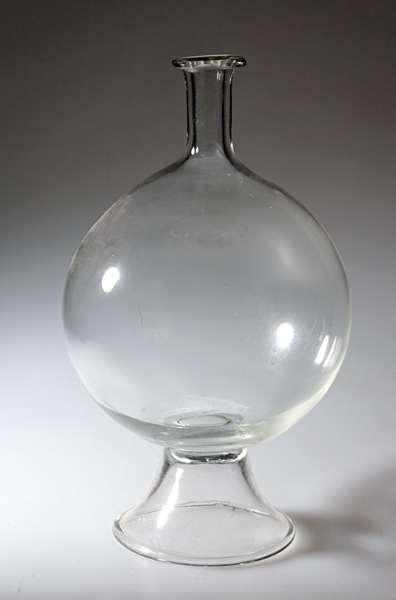 A variation of this form has a glass chimney as seen in the ‘chavillou’ in Figure 16. Figure 15. Left: ‘Lacemaker’s Lamp’. This seems to be a French piece. Right: Basically the same type of lamp in combination with a focusing bottle housed in a homemade box made of a bobbinlace pricking decorated with a religious medal. This box is square, compared to the cylindrical example seen in figure 8. 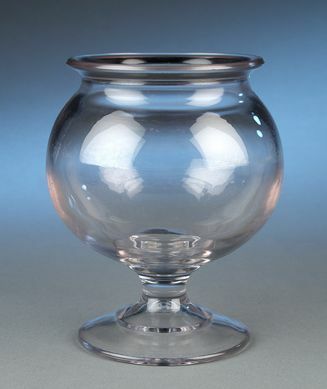 The glass is cylindrical, but still with a support foot. The box is lined with cotton. 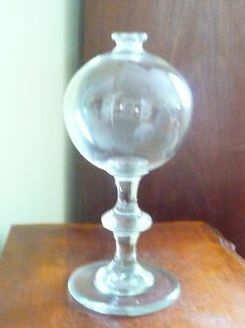 Both glass and the lamp are about 8 cm in diameter. Figure 16. 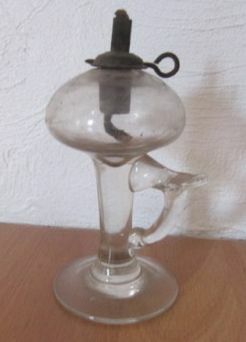 In Velay and Auvergne, lacemakers used a small lamp with much the same base as those shown in figure 15. It is known as a ‘chavillou’. This example is 7 inches tall. The wick is of flax tow. Figure 17: Lace-maker’s Great Candlestick from Wright. 2′ 2″ high without the candle. But generally, it can be very difficult to assign a particular lamp or candleholder to the lacemaking activity without a known provenance. I once saw a kerosene lamp in Zele, Belgium, which had been preserved by the decendents of a lace manufacturer (of the type shown in figure 20). It had been used in the workroom by the lacemakers. A remarkable provenance, but the lamp itself was not particularly unusual. 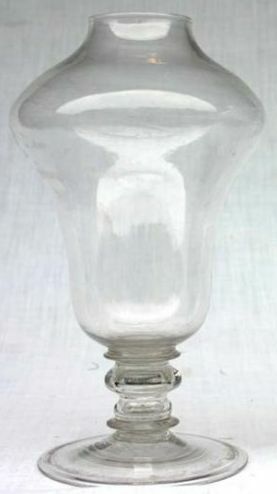 Certain candle holders of the ‘pushup’ type are sometimes known as a ‘lacemaker’s’ lamps, with the term most often referring to ones with a focusing hood. Typical examples are shown in Figure 18. The last example was provided by lace expert Diana Smith who said it was brought to the lace exhibition at the Northampton Museum in 1999 by a woman claiming it was a lacemaker’s candlestick. The candle is placed inside the cylinder with the wick through the hole in the top. A spring pushes the candle up as it burns. Again, no traceable attribution, although it does have an Art Deco look. The other examples have the vented reflecting hood. Figure 18. ‘Pushup’ candle holders are sometimes combined with a reflecting element and given the ‘lacemaker’ name. Left: The pushup base is combined with a reflecting hood. Middle: Another variation, this one labeled A.Barret & Son Picadilly London. Which could imply that this type of device is English in origin. Right: Diana Smith sent this example of a ‘pushup’ lacemaker’s candlestick. The only thing that the rings at the top are meant to mate with is a now lost focusing hood. See also http://www.youtube.com/watch?v=NQj3NLJPth4 for a detailed examination of a pushup candlestick with a focusing hood. Candle reflectors also sometimes carry the name of ‘lacemaking’, and two candidates are shown in Figure 19. Items like those on the left normally come in pairs, are always of brass, and are made in the form of tilt-top tea tables. The top does tilt quite nicely, and one could imagine they could form a reflector behind a candle. But it doesn’t seem too practical, and they are rather small. Still, there are quite a few around, and the name seems to have stuck. 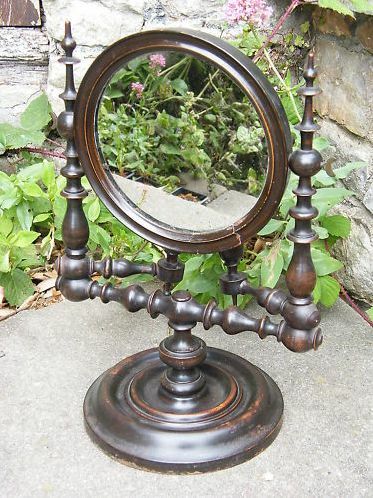 Another item recently appeared on Ebay as a ‘Lacemaker’s Mirror’, although it looks much more like a Victorian shaving mirror. The mirror is supposed to reflect candlelight, and that might even work if the mirror is a little concave to provide some kind of focus. Figure 19. ‘Lacemaker’s lamp reflectors’. 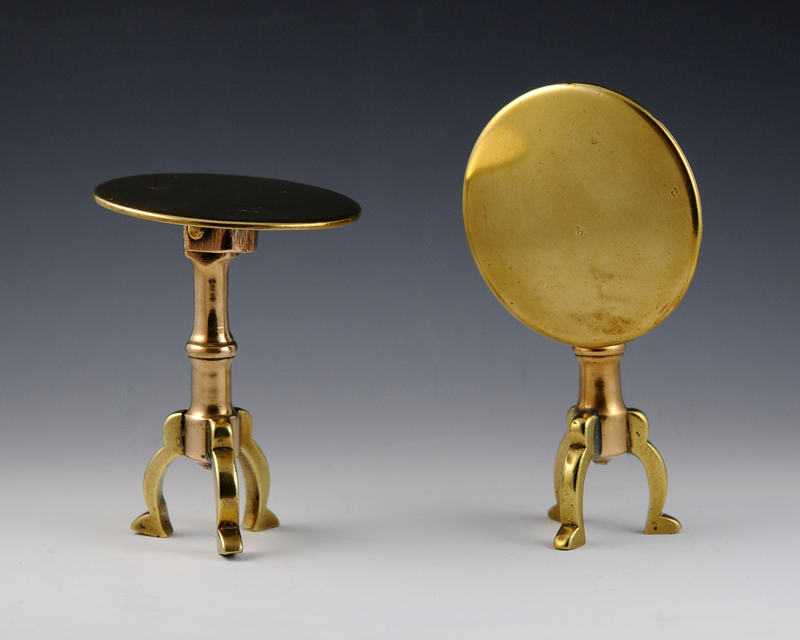 Left: In the fully tilted position these little brass tea tables are about 5-1/2″ tall. Right: A ‘Lacemaker’s Mirror’, although this one seems rather a stretch. The candleholders are positioned at the back, and presumably swing around front. It is implied that the light could be reflected by the mirror, which is probably magnifying. 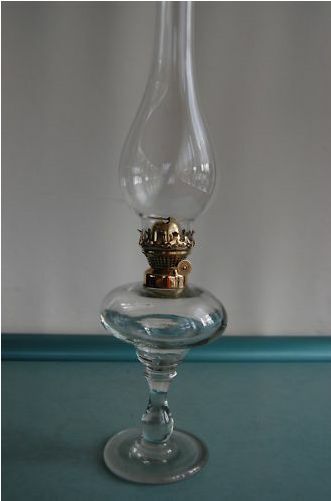 The reflection and focusing function has been used in oil lamps, and a piece with the combined function is often termed a “lacemaker’s lamp”. Figure 20 shows three examples of oil lamps with a focusing reflector. Reproductions are sold today, and originals aren’t too rare. Figure 20. 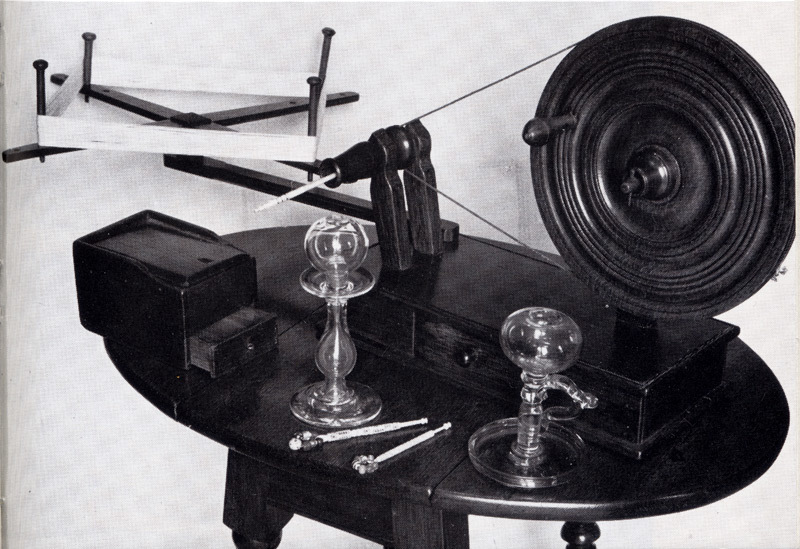 The term “lacemaker’s lamp” is accepted terminology for lamps using hemispherical reflectors. Left: Kerosene lamp from a British maker. Date unknown. 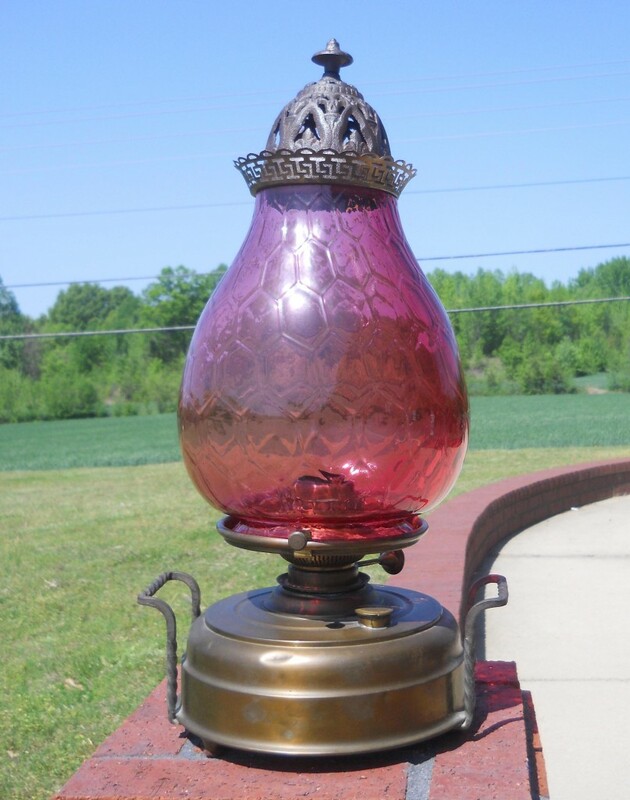 Middle: Brass kerosene lamp with a detachable focusing hood around the glass chimney. This example is dated around 1880. 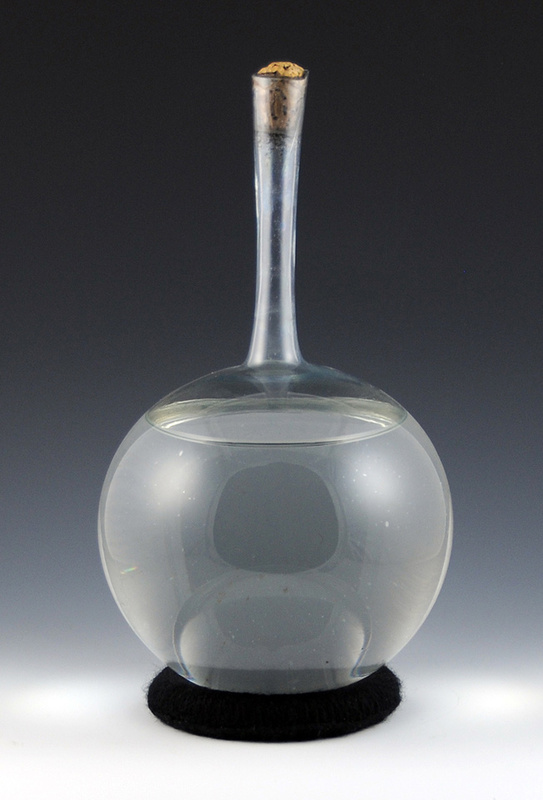 So far we have discussed water filled globes as focusing elements, but there is no reason not to use a solid glass lens. This concept is illustrated in Figure 21, and also provides some reflection with the metal hoods over each lens directing the light downward. 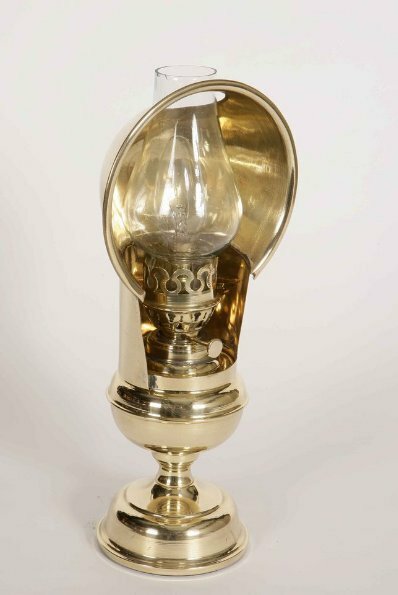 The pewter Gleason Bullesye lamp is often referred to as a “lacemaker’s lamp” and was made in both single and double lens variations. Figure 21. 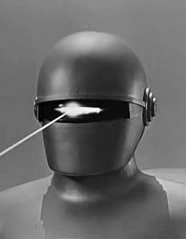 It’s amazing how this early 19th century design has a rather ‘Klaatu Barada Nikto’ look. Left: Original single lens Gleason Bullseye lamp patented in the 1830s by Roswell Gleason of Dorchester, Massachusetts as a work light. 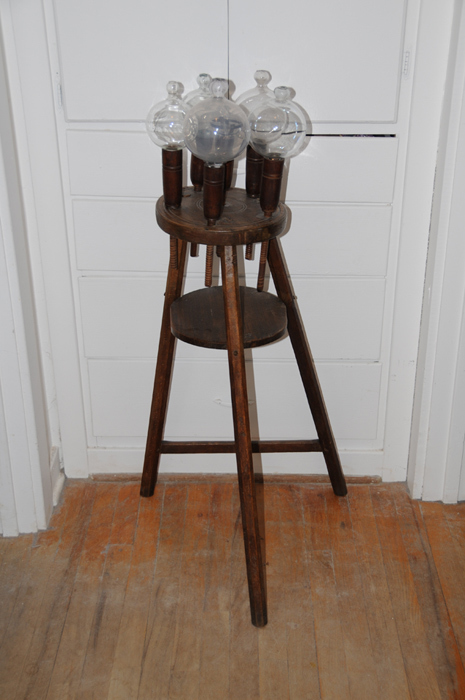 Middle: Award-winning reproduction of the Gleason Bullseye Whale Oil Lamp with double lens. (http://tinyurl.com/jjk8hfr). Since I started this piece, a number of people have identified photos of ‘lacemakers lamps’, which clearly have no practical use as focusing devices, and a very dubious connection with anything having to do with the craft. Figure 22 shows a few examples purely for the enjoyment of the reader. Figure 22. A few examples of “Lacemaker’s Lamps”, illustrating just how far sellers are willing to go with the name. The mere presence of some type of glass bulb, clear or not, seems to be enough to attach the name. Let me close with something a little different, but still light-related. 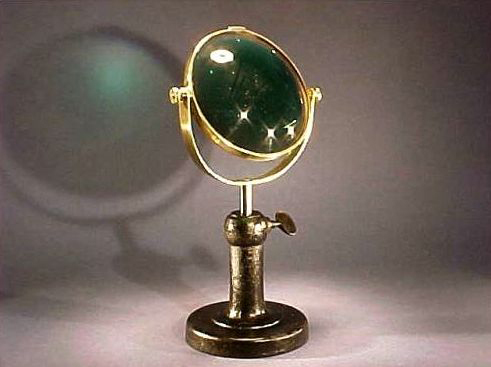 The magnifying glass in Figure 23 is very beautiful; the lens is nearly 5″ in diameter and tinted green. It was advertised as having been used by Argentan needlelace makers, although the seller advises the purchaser to go to the museum in Argentan to see if something similar can be found. I’ll leave that as an exercise for the buyer (myself). Figure 23. 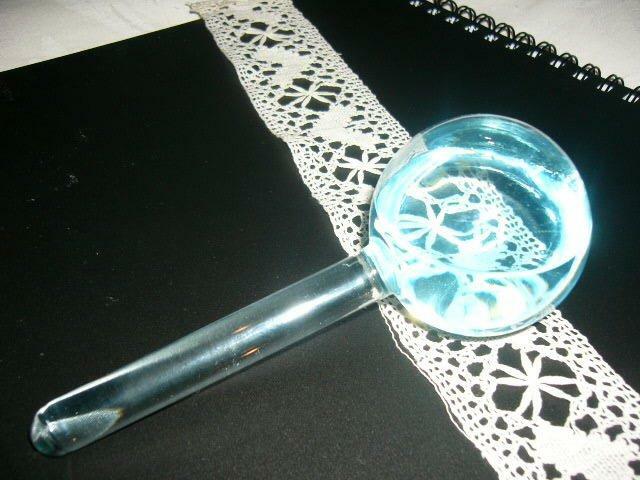 Lacemaker’s magnifying glass? In summary, I hope this discussion will let you think a bit beyond some preconceived notions, primarily that the term “lacemaker” belongs only to those who make lace. Consider it a compliment that the term is now generally applied to a variety of reflecting and focusing devices; it is a tribute, not a deception. 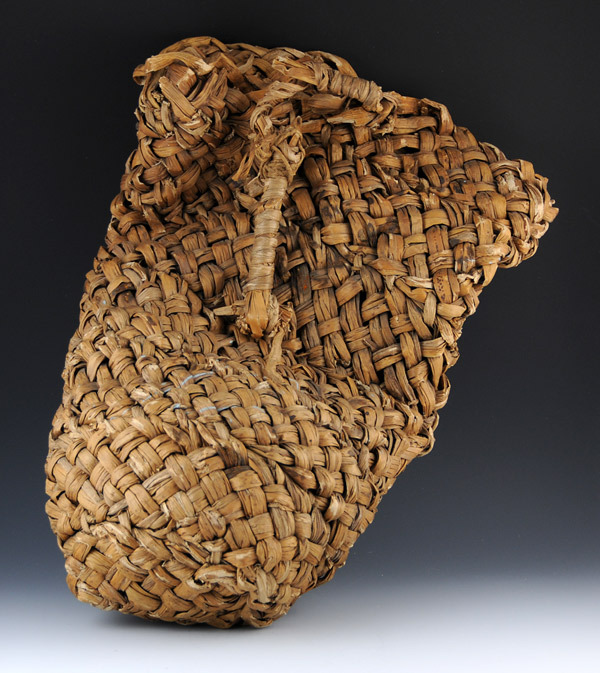 No one should be upset that an object with a different original purpose was found useful to a lacemaker, and it should not automatically be assumed that some mistake has been made. Throughout the years lacemakers often could not afford specialized equipment and made do with whatever was handy (inverted coke bottles filled with water have been cited). Enjoy the diversity of these objects, and experiment on your own, just as the adaptable and resourceful lacemakers of the past did. We stand on their shoulders, not the other way around. An excellent round up of the “infamous” Lace Makers Lamps. Perhpas we have turned the corner in the propagation of misinformation regarding these very lovely and very collectable lamps. Congratulations a great informative article. Thank you for your great articles on lace accessories especially the lighting. I bought a filled globe with a stem all in one, made of glass and completely sealed, in my local market, as I suspected what it was and the owner had no idea. So you were a quick Google reference! I noticed mine has the liquid in to three quarters of the globe part and the whole stem and had a blue tinge. Now I know what might be in the water! So thank you for the help and now I will see if I can locate a stool or wooden holder. I wonder how old mine is as it looks quite modern. Perhaps to was used for other things besides lace making. Thanks Liz! Your comment refers to Brian Lemin’s discussion in his Lace Fairy article on the use of a few drops of sulphuric acid in the water to give it a bluish tinge. Brian also rightly cautions that people trying this should have proper training in handling chemicals – it’s very easy to make a nasty mistake. Do not try this on your own! Hello Laurie – Thanks for commenting on my candlestands article. * While working on it I was interested to find that the lacemakers’ flasks used to be called “flashes” in some parts of England, and the stand with candle and globes was the flash-stool. You are definitely correct about the ‘flash’. I’ll do some looking in my books to see if I can spot some references. 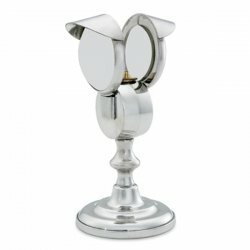 Thanks so much for your article on the other types of candlestands. Our communities definitely should talk more.